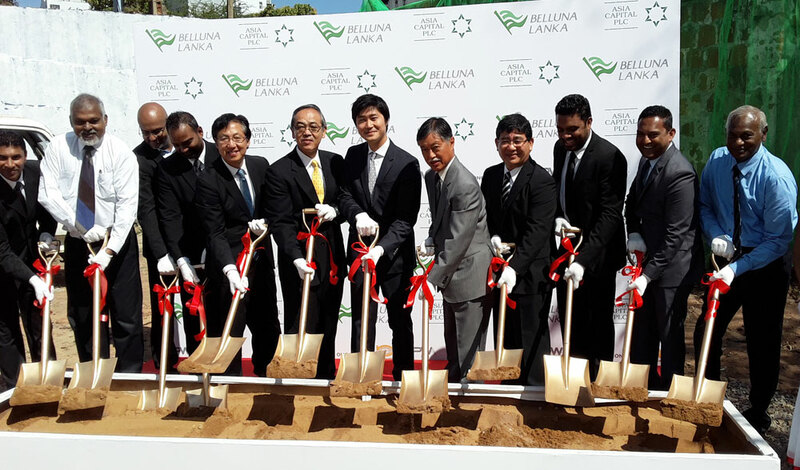 Asia Capital PLC in collaboration with Japanese foreign investor and partner, Belluna Co. Ltd, has launched an exclusive apartment development project in the upscale Union Place location at a project cost of over USD 50 million (LKR 7.3 Bn). The ground-breaking ceremony of the real estate development titled ‘Luna Tower – Four Four Seven’ was held on 12th October 2016 at the development site, in the presence of eminent invitees comprising of the senior management of Asia Capital and Belluna; government officials involved in the project including CMC and UDA representatives; and the Japanese Ambassador to Sri Lanka - His Excellency Mr. Kenichi Suganuma. Hon Dr. Sarath Amunugama - Minister of Special Assignments also graced the occasion. Philip Weeraratne Associates (PWA) are the Principal Architects for the project. Two global powerhouses have joined hands with PWA on this project: Arup of Hong Kong, bring their depth of expertise by way of a complete structural review of the apartment complex; Ong&Ong of Singapore, bring in unparalleled technical expertise in design excellence. Onsite piling for the project has already commenced by Nawaloka Piling Pvt. Ltd and ‘Luna Tower – Four Four Seven’, is scheduled for completion by October 2019. ‘Luna Tower – Four Four Seven’ is a 200-apartment building located centrally at Union Place, offering speedy and convenient access to the commercial and entertainment areas of Colombo. Its unparalleled location offers sweeping vistas of the Beira Lake on one side and the Viharamahadevi Park on the other. The project is conceptualized as a blend of indoor and outdoor living spaces for a soothing and natural experience, making the best of natural light and ventilation. The apartments are seamless in design and offer compact modern living ideas for greater convenience. The apartment building will feature a large lobby with reflecting ponds and greenery, a rooftop infinity swimming pool and club house, including a landscaped garden, gymnasium, function room and a pavilion that opens out on one side – all of which offer common spaces on multiple levels in the apartment building. The joint projects between Asia Capital and Belluna consist of the ‘Luna Tower – Four Four Seven’ apartment development at Union Place; a 48 villa ultra-luxurious resort in Galle for which the foundation stone will be laid on 13th October 2016; a 300-room city hotel on Marine Drive in Colombo 03 for which the land is already acquired; and construction of the first resort beyond the shores of Sri Lanka in the Maldive Islands. A further multi-development project in Colombo is in the pipeline, with land being sourced presently. Belluna Co Ltd’s Joint Venture with Asia Capital PLC clearly spells out the company’s commitment to Sri Lanka.